Heat extra virgin coconut oil in a soup pot and saute the garlic and onion until limp. Cook meat for several minutes, stirring to ensure cooking on all sides and through to the center. Set aside. Add the fresh veggies and continue to stir to saute them for a few minutes, until they begin to soften. Add the meat, tomatoes, beef broth, salt and pepper to taste. 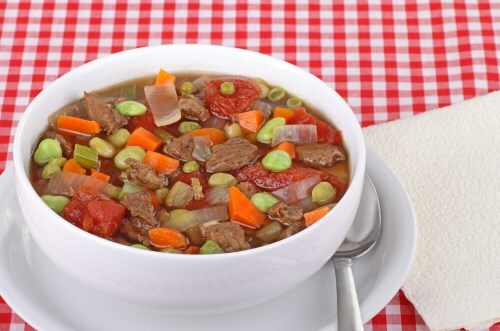 Bring soup to a boil, reduce heat, and simmer for a few minutes (up to about an hour) over low heat.